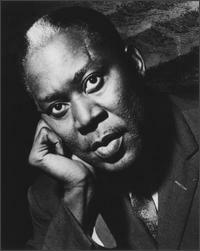 Memphis Slim (a.k.a. John "Peter" Chatman) is recognized as one of the greatest blues piano players of all time, and deservedly so with a career that spanned six decades and produced classic songs like "Mother Earth," "Lend Me Your Love," "Rockin' The House," "Nobody Loves Me" (later recreated by numerous artists, like B.B. 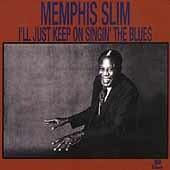 King, under the title, "Every Day I Have The Blues"), "Memphis Slim U.S.A.," and "The Come Back." Slim wisely sought out his own performing style at an early age, bringing an air of sophistication to his playing, more of an urban sound. His warm, mannered vocals were also unique at the time, and soon most piano players were doing their best to emulate his sound.﻿ Though he did record as a solo artist for Okeh in the late 30's, Slim also served as accompanist for guitarist Big Bill Broonzy for most of the early 40's, before striking out on his own for good in the middle of the decade and forming his own band, the House Rockers. Slim moved around quite a bit from record label to record label through the 40's and early 50's, before settling with United Records in 1952. With United, the piano man decided to try something different. Prior to his tenure with United, he had only used guitar on two sessions, and had never had a guitar in his working band, even though he had played with Robert Johnson during his early years and with Broonzy. 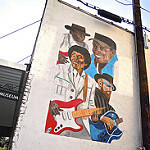 However, Slim was savvy enough to realize that the guitar's role in the blues was changing, thanks to the slick urban blues coming from artists like T-Bone Walker and Johnny Moore, and when he caught wind of a young guitarist based in his native Memphis, he decided to expand his sound, and the result was some of the best blues ever for over ten years. 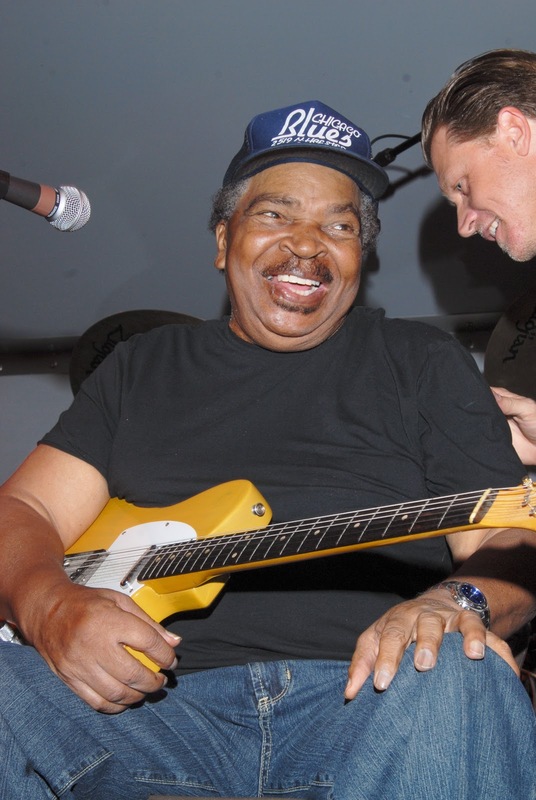 Mississippi native Matt "Guitar" Murphy was only in his early 20's, but already he had served as guitarist on multiple recordings by Bobby "Blue" Bland and Junior Parker, and had also played in Parker's band and with Howlin' Wolf during the late 40's. He mixed jazz influences with raw amplification and set the Bluff City on its ear. Though he enjoyed local guitarists like Calvin Newborn and Robert Lockwood, Jr., he was more influenced by the likes of Walker and Moore on guitar, and by sax players like Sonny Stitt, Charlie Parker, Arnett Cobb, and Gene Ammons. Indeed, Murphy claims that he got most of his riffs from horn players. Wherever it came from, his playing was years ahead of its time. It was sophisticated and rough at the same time and he was one of the most adventurous, creative, and influential players of that era. Slim had heard of Murphy's formidable skills from friends in Chicago, and made the journey down south to see what all the fuss was about. Referring to guitarists, Slim once famously said to blues historian Jim O'Neal, "There was two things I couldn't stand in those days. I couldn't stand no damn guitar and harmonica. But Murphy was such a damn genius, man, 'til I had to use him. 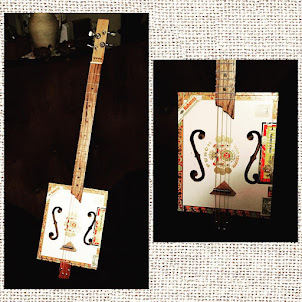 And after that, I damn near had to have a guitar." Perhaps what caught Slim's ear with Murphy's guitar playing was the fact that he was more influenced by horn players and his jazz leanings, which actually would have been a better fit to Slim's urban style than what many other Delta-based blues guitarists like Broonzy were playing. When Murphy came on board for the United sessions, he also helped with arranging songs. The four United sessions included 30 songs, of which about a quarter were instrumentals. These sessions are unquestionably some of the finest sides that Memphis Slim ever committed to wax, and were later packaged into two albums by Delmark Records, Memphis Slim U.S.A. and The Come Back. 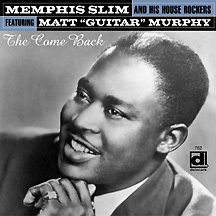 Here's a nice pair of tracks featuring Slim ("Memphis Slim U.S.A." and "The Come Back") and a typically amazing instrumental featuring Murphy ("Back Bone Boogie"). 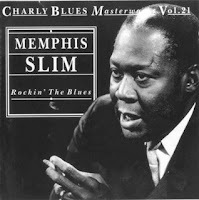 In the late 50's, Memphis Slim ended up at Vee-Jay Records, where, in a two-year span, he released what many blues fans consider to be his greatest recordings. He re-recorded most of his great songs during this span, but these recordings are the definitive versions, thanks in no small part to the presence of Matt Murphy. These sides have been collected and re-collected over the years, with the best version being the Charly release, Rockin' The Blues. 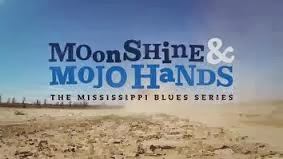 Below, you will hear "Messin' Around With The Blues," the instrumental "Steppin' Out" (later covered by Eric Clapton during his tenure with Cream), "Rockin' The House," and Slim's legendary "Mother Earth." 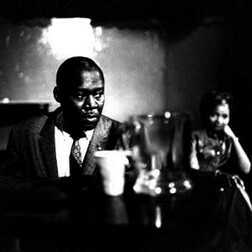 In the early 60's, after appearing at the first of several American Folk Blues Festivals, Slim decided to make the move to Europe, where he was able to take advantage of greater recording opportunities, more chances to tour, and more adulation and acclaim than he would have ever received in America. Before he made the move, however, he recorded one last session with Murphy before heading overseas, later issued as I'll Just Keep On Singin' The Blues. This is a hidden gem in the Memphis Slim/Matt Murphy catalog with songs like the rocking opener, "Lonesome," and "Cold Blooded Woman." 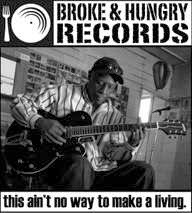 After Slim's departure, Murphy ended up playing in James Cotton's band in the early 70's, shining on Cotton's recordings for Buddha Records. 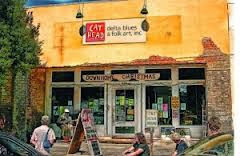 He did appear at the 1963 version of the American Folk Blues Festival with Slim and Sonny Boy Williamson, Muddy Waters, Big Joe Williams, and Lonnie Johnson. Among the highlights that years was Murphy's blistering version of "Matt's Guitar Boogie." Prepare to be dazzled by this version, with backing from Memphis Slim on piano, Willie Dixon on bass, and Billy Stepney on drums. Now check out Murphy returning the favor, backing Slim on "I'm Lost Without You," also recorded in Europe during the 1963 tour. To be honest, while both artists did have their moments before and after their partnership, they never sounded better than when playing together. Nearly everyone who listens to the blues knows what happened to Matt "Guitar" Murphy after his stint with James Cotton......he was recruited into the Blues Brothers Band (say what you will about Jake and Elwood, but the boys had good taste), serving as guitarist with Steve Cropper and increasing his exposure level a thousandfold. 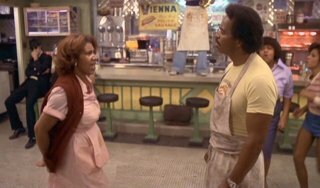 Murphy even ended up with a speaking part in the inevitable Blues Brothers movie in 1980, playing himself alongside Aretha Franklin (as his aggravated wife) and taking part in the accompanying musical number. He also appeared in the sequel some twenty years later. 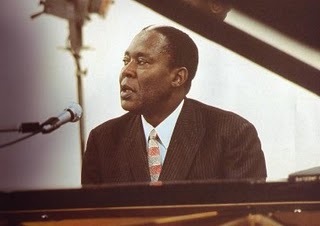 Memphis Slim continued to record and perform in France and other European countries. He appeared on French television, acted in several movies, and enjoyed life as a genuine celebrity. He did return to the States occasionally to perform, even pairing up with old friend Murphy in 1985 for a live recording released by Antones in the late 80's. It was like the two of them had never been apart. 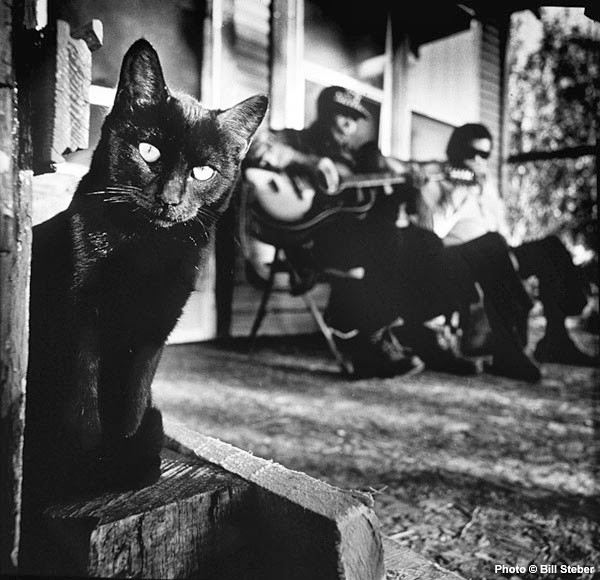 Slim passed away in 1988, at age 72, of renal failure. He was active up until the last six months or so of his life. 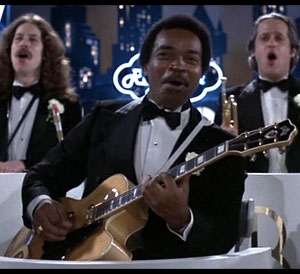 Matt "Guitar" Murphy continued to perform, eventually recording a wonderful disc for Antones, called Way Down South, and two later discs for New England-based Roesch Records. Murphy suffered a stroke in 2003, during a gig in Florida (which he managed to finish playing one-handed). 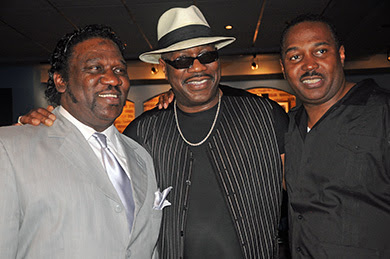 After a long, frustrating, but determined rehabilitation, Murphy made a triumphant return to performing with James Cotton during the 2010 Chicago Blues Festival. 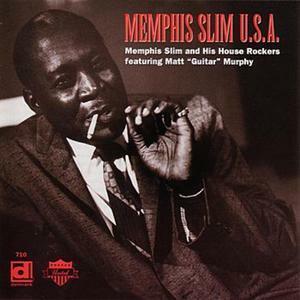 Although both Memphis Slim and Matt "Guitar" Murphy earned many accolades throughout their careers, most blues fans realize that their best work may have taken place when they shared the stage or studio. Each one was a perfect complement to the other, truly a match made in Heaven. There are four or five essential recordings featuring Memphis Slim with Matt "Guitar" Murphy. You can't go wrong with any or all of them. Memphis Slim U.S.A. and The Come Back (Delmark Records): These two discs capture the highlights of Slim's four sessions for United, his first recordings with Murphy. There are some wonderful unreleased tracks on here as well that make you wonder how in the world they never saw the light of day until several decades later. Rockin' the Blues (Charly Records): This disc is the best representation of Slim and Murphy's recordings for Vee-Jay. Slim reprised some of his best songs throughout his early years for Vee-Jay, and these are actually considered the definitive recordings of some of those songs. This disc is out of print, unfortunately, but is pretty easily found online. I'll Just Keep On Singin' The Blues (32 Jazz): This is a later session of the pair, just before Slim departed for Europe in 1961. Both men sound great here and this is a great, unheralded set that should be more widely heard. 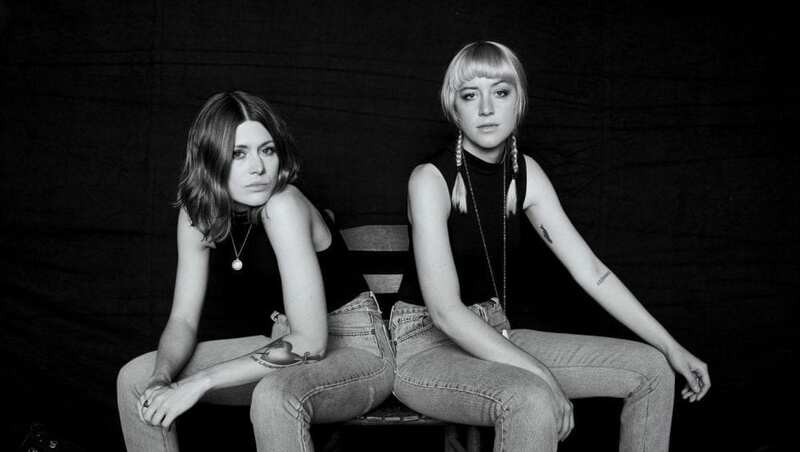 Together Again One More Time (Antones): What's amazing about this live release is that if you weren't familiar with either artist, you would have thought that they had been playing together for years instead of being separated for over twenty years. 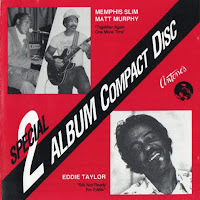 This is a really nice send-off for this incomparable pair, and is part of a special two-fer set.....the other half of the disc is a really nice Eddie Taylor set from the same time period. 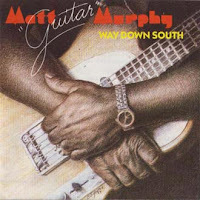 If you would like to hear more of the amazing Matt "Guitar" Murphy, I highly recommend Way Down South (Antones). Murphy leads a fine band (including his brother, Floyd, a legendary guitarist in his own right) through a great mix of original tunes and instrumentals. This is one of my favorite discs ever and will probably rank near the top for you, too.